JANELLE PATTERSON The Marietta Times U.S. Sen. Rob Portman looks through the fence surrounding the historic Barker House in Newport Township Tuesday. JANELLE PATTERSON The Marietta Times From left to right, Wes Clarke, Jack Haessly, Rob Portman and Bill Reynolds, go over the federal ownership of land where the historic Barker House sits in Newport Township, following lunch in Haessly’s home Tuesday. NEWPORT TWP. –One of the top endangered historic sites in Ohio had a visit Tuesday that could lead to some federal support. U.S. Sen. 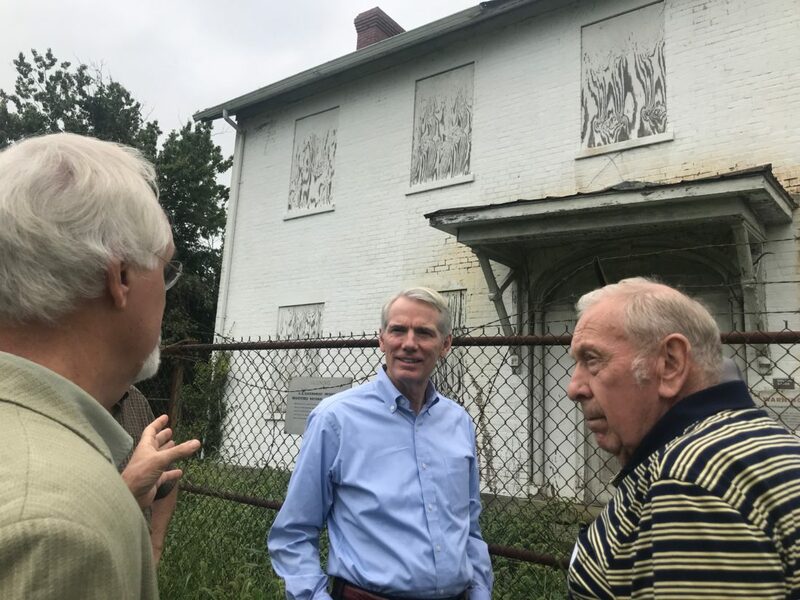 Rob Portman, R-Ohio, joined the Friends of the Barker House board to discuss not only the significance of the Judge Joseph Barker Jr. House located on Ohio 7 south of the Willow Island Lock and Dam, but also what efforts are needed to preserve what the home represents. The house was built close to 200 years ago, and is one of the few remaining with the unique characteristics of Federal style still standing strong, despite years of weathering on the brick structure sitting along the Ohio River. Last month, Preservation Ohio recognized the site on its most endangered list for 2018 because the home was scheduled to be demolished by the end of fall. 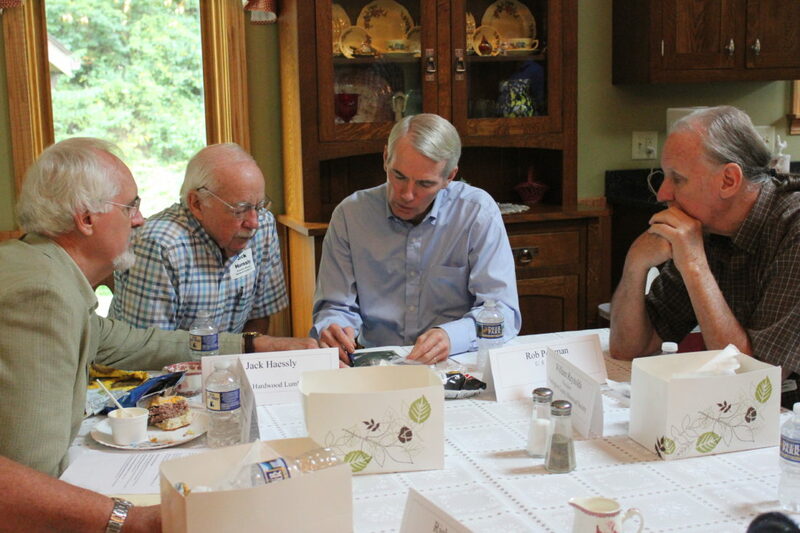 JANELLE PATTERSON The Marietta Times From left to right, Wes Clarke, Jack Haessly, Rob Portman and Bill Reynolds, go over the federal ownership of land where the historic Barker House sits in Newport Township, following lunch in Haessly's home Tuesday. So Portman met with the local organizers seeking to preserve the building and the connections to the Women’s Suffrage movement, the abolition of slavery and the local preservation of rural education and history. “I thought it was going to be fieldstone rock, but look at how those stones fit together, they did it right,” said Portman as he examined the foundation of the house Tuesday. 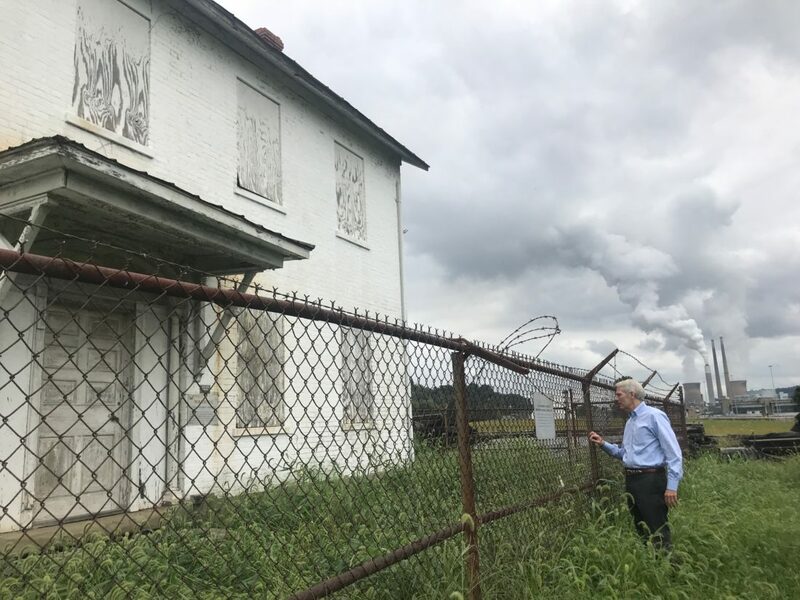 Portman is in his own of process of restoring an old Quaker home, he explained, and said society’s connection to history is more tangible when one can feel it, walk through it and see it. The Barker house was listed in the National Register of Historic Places in 1979 for important associations with master builder Col. Joseph Barker, one of the earliest white settlers in the Marietta area who was lauded as a regional practitioner of the Federal style of architecture. He built the Newport Township home for his son, who later became a judge in Washington County Common Pleas Court, but also served as a lawmaker in the 1830s in the Ohio General Assembly. “Col. Barker was a ship builder who would build up these boats in his sawmill and then wait for the Muskingum River to flood to lift up those and send them down river to be sea-faring ships,” explained Bob Rhoads, a member of the group raising funds and support to save the house. 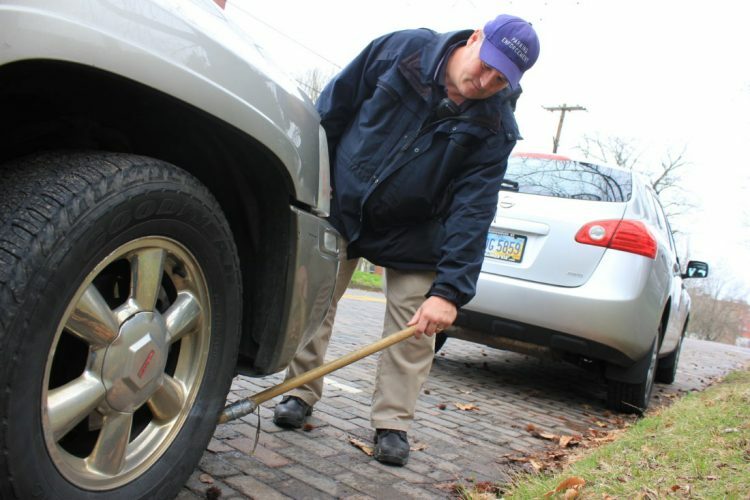 But Judge Barker is also significant to the township for more than his positions. But the Barker house currently stands on the property of the U.S. Army Corps of Engineers. The corps used the building for its offices during the construction of the Willow Island Lock and Dams but have since let the building fall into disrepair. The corps has the land distinguished for use when dredging the river, though the practice is not often used anymore. They originally gave a short window for interested parties to purchase and move the building this past winter, but have extended that deadline several times over the summer and allowed the Friends of the Barker House to have the building professionally appraised to estimate the cost and process for moving the house. Archaeologist Wes Clarke noted that the home is a nationally registered historic place, but is worried that if the Corps insist the building be moved off its land the home may lose its designation. 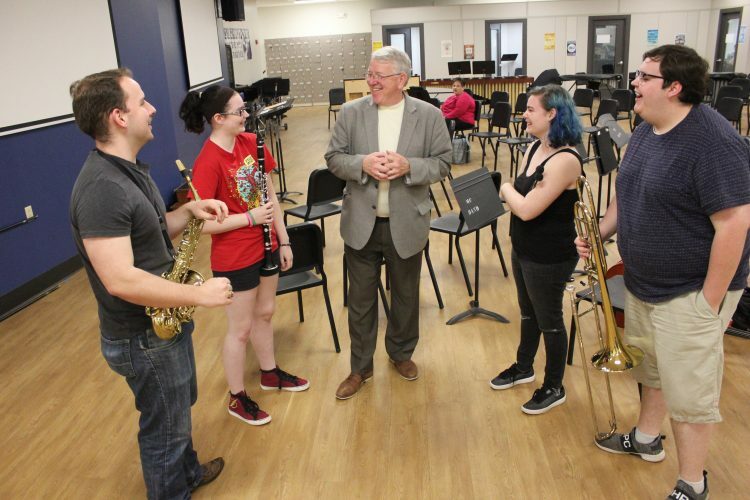 “We’d work to keep that, but it’s very rare that if you move the structure, which the Corps has after much negotiation said we’re allowed to do, you’d be able to keep that designation,” said Clarke. Portman said he’d rather see the federal dollars and locally raised funds used to restore the property and make it a draw not only for historic education, but also for education about the river lock system and the dam. 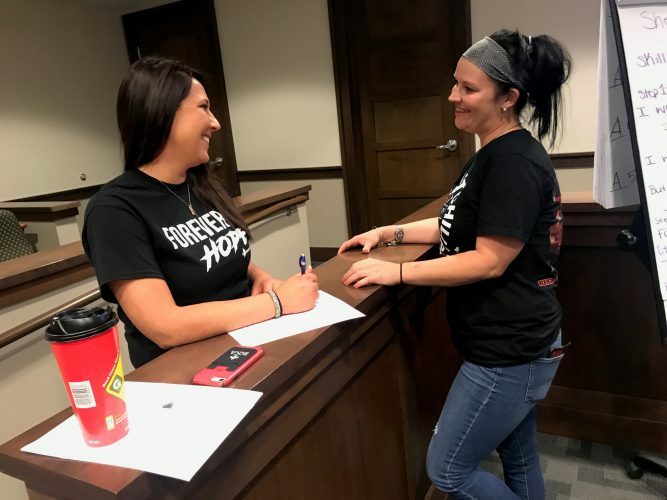 • The Friends of the Barker House intend to create a 501(c)3 nonprofit to take donations for the stabilization and restoration of the Judge Joseph Barker Jr. House. 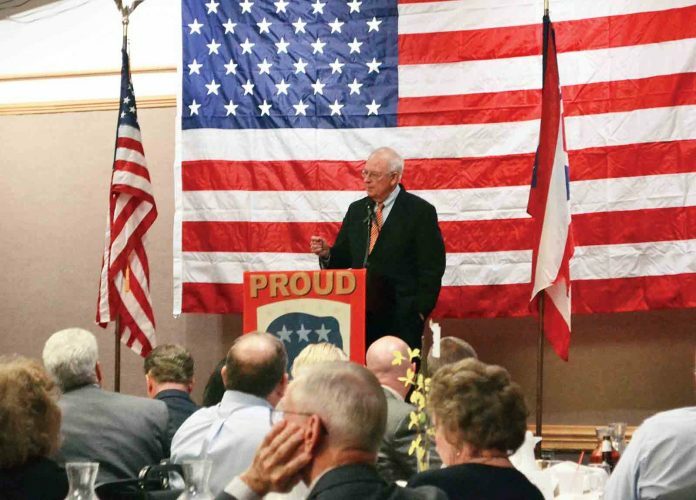 • Ohio Sen. Rob Portman is speak with the U.S. Army Corps of Engineers leadership on the project.